WOW! This TED Talk is a must-see for every mom. I found it so moving to see this emotional Yale professor explain why he has come to believe that the intricate, wondrous creation of a new baby can only be explained by “Divinity.” What a wake-up call for us moms, a reminder that every single run-of-the-mill pregnancy is such an incredible miracle. 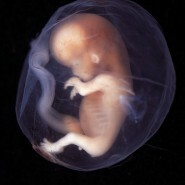 The video contains phenomenal images from conception to birth. This moved me so much. I feel humbled and in awe that Hashem chose us women to be a part in this human creation. I thought the image of a naked woman at the end of the video wouldn’t be appropriate for male viewers. I’m sorry. But I don’t agree. All males c their wives at some point naked. (hopefully often!!) and it’s not like it’s a real image anyway…. On the contary, I think men SHOULD c it and understand how it all happens! !